Psychologist Chicago: Is It The Baby Blues or Postpartum Depression? As you bring a new baby into the world, you may expect to be in a state of pure bliss and happiness. Instead, you might have gotten blindsided by a whirlwind of negative emotions such as anxiety, stress, sadness, loneliness, and moodiness. While you may have been looking forward to finally getting to bond with your baby, you end up feeling guilty because you can’t stop this rollercoaster of emotions. It is very normal for new mothers to experience a mild case of depression often referred to as “baby blues”. However, some experience a more severe form of the blues called postpartum depression. Understanding the difference between the two can help you identify which one you may be struggling with and seek out the proper support you need. Experiencing the baby blues or postpartum depression does not make you a bad mother, but recognizing the problem is the first step needed to feel like yourself and become a happier and more attentive parent. Below is a more detailed description of both the baby blues and postpartum depression. According to Psychology Today, 50-80% of moms experience a more mild form of depression after pregnancy called the baby blues. The baby blues usually occur within the first few hours of delivery and taper off within the following two weeks. While the baby blues are short-lived, their symptoms definitely do not go unnoticed and should not be ignored. The symptoms of the baby blues are typically a result of the drop in hormone levels and increased stress of giving birth. Some of these symptoms include excessive weepiness, forgetfulness, stress, irritability and moodiness, which can all have a negative impact on the mother. During this time, it is important to lean on your support system for help to get through the next couple of days or weeks. If the baby blues aren’t fading after two weeks, it may be time to consider the possibility of postpartum depression. Postpartum depression effects around 10-20% of mothers and can creep up anytime within the first year after childbirth. 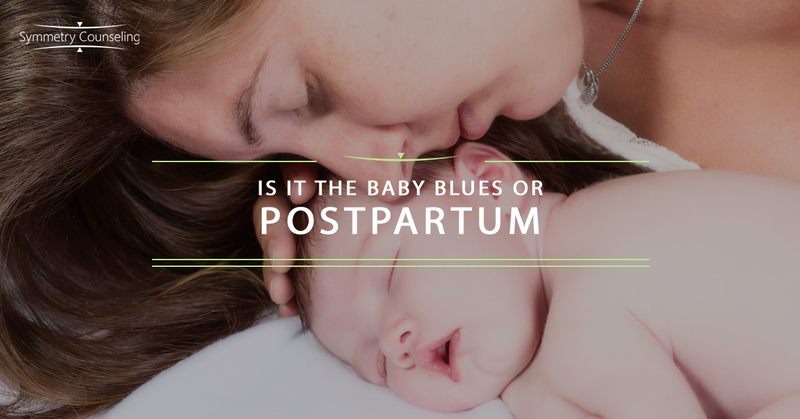 At the beginning, postpartum depression can look like the normal baby blues as they share similar symptoms such as weepiness, mood swings, insomnia, and irritability. The main difference between the two is that those experiencing postpartum depression tend to have symptoms that are more severe and longer lasting. Some of the more serious symptoms of postpartum depression include feeling worthless, anxiety, depression, thoughts of suicide, lack of interest in the baby, inability to bond with the baby, and inability to care for yourself or the newborn. If you are experiencing any of these symptoms, even if it is within the first few weeks after childbirth, make an appointment with your doctor or a therapist that specializes in postpartum depression immediately. It is important to not let these symptoms go untreated as postpartum depression can continue on to be a chronic condition if there is no intervention. Every mother needs support and you deserve to be happy at this time, so seek out the help you need to get yourself there! If you are currently struggling with symptoms associated with the baby blues or postpartum depression and would like some support, it may be useful to connect with a therapist. Contact Symmetry Counseling at 312-578-9990 to set up an appointment with one of our very skilled therapists today!